This Fuerteventura Map shows The Airport, popular Resorts & Ferry locations. Click the name in the right column to highlight the location on the map. Soft, white sands, rolling waves and attractive resorts make Fuerteventura, the second largest of the Canary Islands, a natural playground for beach lovers and watersports enthusiasts. If you don’t want to do anything more energetic than lie on the shore and soak up the sun, Fuerteventura is a wonderful place to unwind – days can almost come to a complete standstill and evenings seem to roll on endlessly towards the cobalt blue horizon. 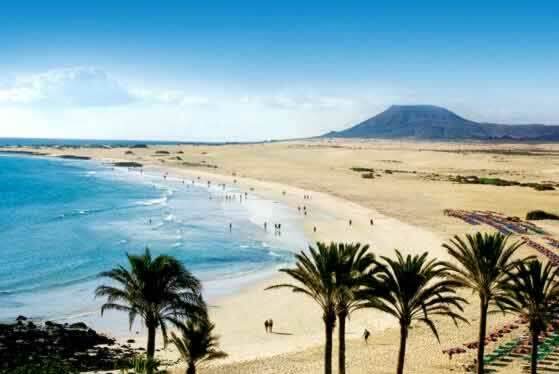 If you are a lover of fine sandy beaches then Fuerteventura is for you. from small sany cove to massive miles long beaches Fuerteventura has the lot, in fact there are over 150 beaches onthe island, making up over 20% of the 340 kilometre coastine, thats almost 70 kilometres of fabulous beaches.. The beautiful 7 kilometre long Grand Corralejo beach and the 32 kilometre long white sand Jandia beaches have both been backdrops to photographic and movie fashion shoots. More information on Fuerteventura Beaches. The main crops on the island are tomatoes and potatoes, so expect to find these used in many of the regional specialities such as 'puchero', a Canarian stew and 'papas arrugadas', small, salted potatoes cooked in their skins and dipped in 'mojo', a sauce of parsley or red peppers mixed with oil and garlic. The ever popular 'paella' features heavily on the menu as does ocean fresh seafood including sardines, tuna and squid waiters will often bring a tray for you to choose from. Follow this with some of Fuerteventura’s famous goats' milk cheese, 'majorero'. Evenings in Fuerteventura are typically a low key affair with discos and nightclubs a little thin on the ground. Instead, much of the evening entertainment is based in the hotels. Corralejo boasts a handful of bars, several discos and a good selection of restaurants while Caleta de Fuste has a wide range of bars and restaurants catering for most tastes and budgets. Evenings in Jandia amount to good food, accompanied by a bottle of wine and friendly company whether in a local tapas bar, international restaurant or in the nearby Canarian fishing village of Morro Jable. Cool evenings, laid back cafes and low key nightlife are the perfect balance to long days spent on the beach. Many venues are geared to attracting families with family entertainment especially many of the hotels and a fair numbers of bars. Sightseeing: Fuerteventura isn’t all about beaches. Head inland and explore the barren, volcanic landscapes or follow in the footsteps of Berber pirates and pay a visit to Betancuria, the former capital, built on the sides of an extinct volcano. Now a little village in a green valley surrounded by hot, windswept scrubland, it has the appearance of being a mirage. Sun & SandFuerteventura is home to some of the finest beaches in the Canaries – 152 unspoilt stretches of silky sand and translucent seas, many of which lie completely empty. The coastal breeze makes the embracing waters excellent for windsurfing and other watersports. The long rolling expanses of gleaming white dunes that make up Corralejo National Park are an unofficial naturist reserve with plenty of room to perfect your all over tan without being disturbed. Corralejo is Fuerteventura livelest resort located on the northern tip of the island. The famous Corralejo beach, Grand Playa is located just south of the town and stretches for 7 kilometers. Dialling code from UK to Fuerteventura is +34, followed by the local area code and then the subscriber’s number. Dialling code from Fueteventura to the UK is +44, followed by the local area code without the 0 and then the subscriber’s number.